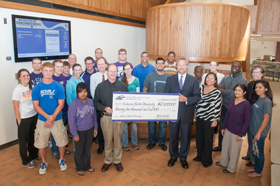 Chevron Phillips Chemical has made a gift of $25,000 to the College of Engineering and to career and employment services at Kansas State University. The gift to the Corporate Partner Program at career and employment services will help fund student career workshops and the updating of technology and software resources. Chevron Phillips' support of the College of Engineering will impact many programs, including the multicultural engineering program, Scholars Assisting Scholars tutoring program, chemical engineering's mentoring program called CHUMS, mechanical engineering scholarships, the robotic competition team, and the student professional chapters of the American Institute of Chemical Engineers and IEEE. Rick Kinder, a native of Dodge City and a Kansas State University chemical engineering graduate, is currently the plant manager of Chevron Phillips' plant in Orange, Texas, and the executive liaison to the university. “Chevron Phillips supports K-State's College of Engineering because it provides us with the high-caliber professionals we need for our operations. Students at K-State get the education, training and experience they need to be an asset to our company from day one," Kinder said. "The gift from Chevron Phillips allows our students to be involved in professional programs and competitions which prepare them for a successful future in their chosen professions," said John English, dean of the College of Engineering.